Straight Workstation is ready to work in less than an hour. Workstation includes desk surface, pedestal and panels. Durable melamine surfaces are scratch-resistant and stain-resistant. Removable metal face plate on desk legs hides cords and cables. Metal-framed, cushioned acoustical panels are covered by two-toned fabric. Adjustable levelers are installed to compensate for uneven surfaces. Workstation accepts articulating keyboard trays. 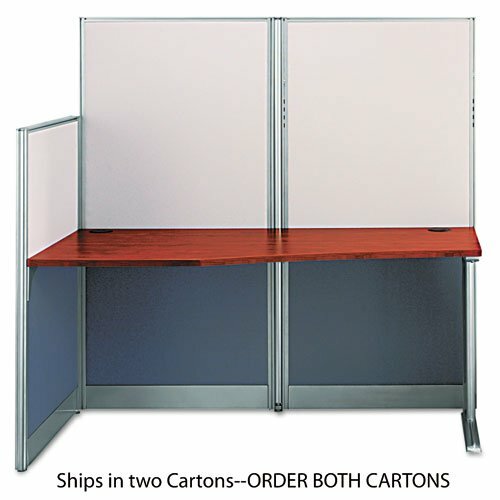 Workstation comes in two boxes and must be ordered separately for a complete unit. Furniture meets or exceeds applicable ANSI/BIFMA standards.